Collection of unusual and creative staircase designs from around the world. Creative “floating” stairs designed by Florence architect Guido Ciompi for The Gray Hotel in Milan, Italy. Creative stairs made from skateboard decks. Creative inside-out hanging box stairs. With a press of a button–and some hydraulic pistons–this staircase folds up and disappears into the wall. What a great way to utilize a generally overlooked space! Step and store in style, using each step as storage for a different item. Glass cantilever staircase with full height independent glass panel balustrade and wall mounted handrail. 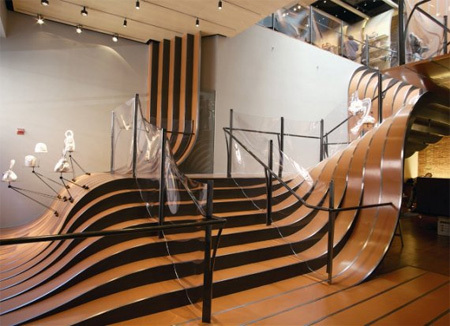 Creative stairs at the Longchamp Store in New York City. 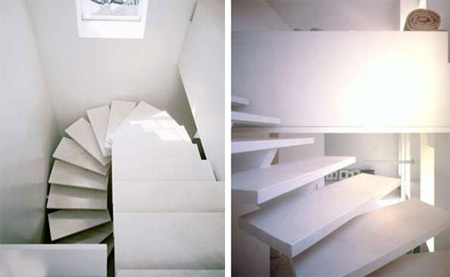 Creative stairs in a private residence in Stockholm designed by Gabriella Gustafson and Mattias Ståhlbom. No matter how much space you’ve got you probably need smart storing solutions. Creative stairs that are designed to be easy to access by wheelchairs and prams. 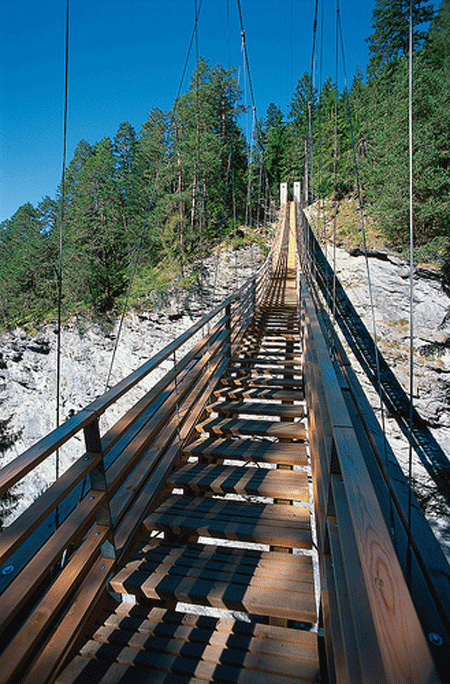 Creative staircase bridge that covers a distance of 56 metres. 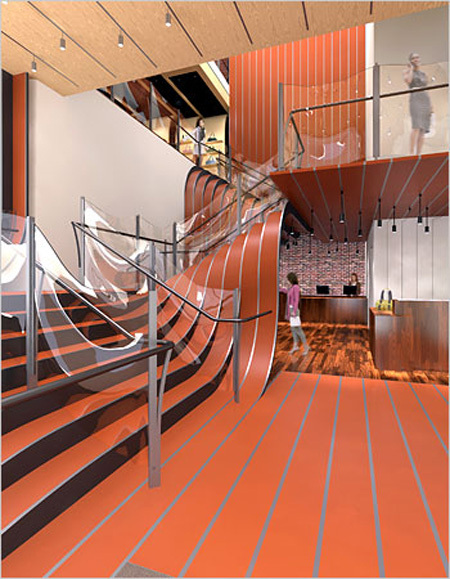 The stairs’ design was based on the idea of a ribbon and connects two floors of a 12th Street penthouse designed by Gabellini Sheppard Associates LLP in collaboration with Jay Smith. 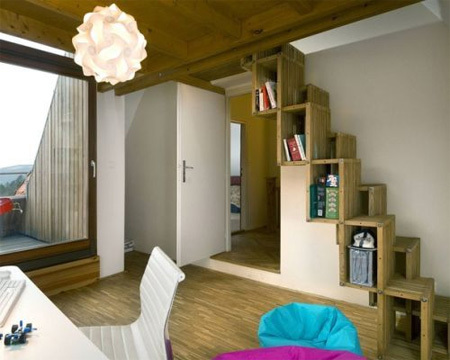 Levitate Architects came up with this ingenious solution to a book storage problem and created a loft-like bedroom nestled under the roof of the top-floor apartment. Three Czech designers have created an intelligent alternating tread staircase that doubles as bookshelves. I could really use some of those storage style staircases myself! Although these designs are really innovative, I think the alternating steps can be a problem for the sleepy/uncoordinated/drunk. These are amazing! The blue-colored one that is both stairs and a wheelchair ramp, that is absolutely genius! It should be everywhere, it’s space efficient and very accessible. I really love the idea. To Mortal Light: the “sleepy/uncoordinated/drunk” people have trouble on regular stairs too! I’ve seen drunk people have troubles on solid ground. The disappearing stairs are obviously fake. Or, at least, they are just a concept model, and not actually implemented in a full-size home or business. The rest are pretty sweet, though. the four last ones are inspiring! As a staircase designer, I’m really getting a kick out of these comments. @farking staircase: wtf? that job title is obviously ‘shoped. no one EVAR had a job only to design staircases. Great designs, no doubt. Lots of people will die though. 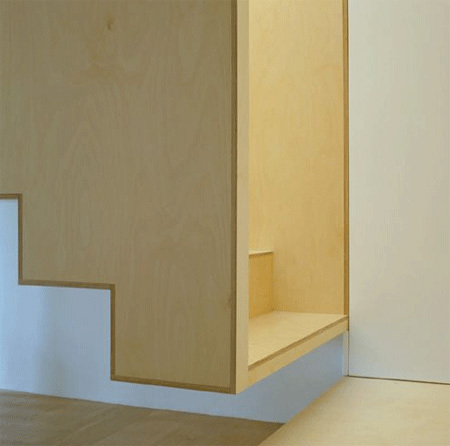 It seems like the stairs that are also storage spaces would be very loud to walk down. I have seen drunk people try to fall off a floor. Same with super sleepy people. I think that if you owned a staircase like this, and you drank, maybe you would be smart enough to have a couch/blanket/pillow set up downstairs. 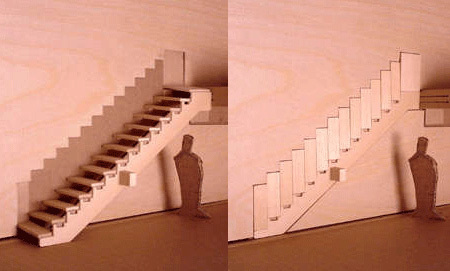 Amazing concepts for staircases. 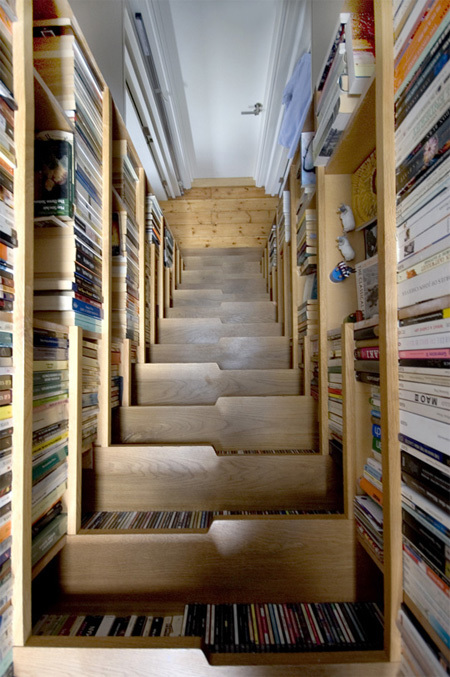 I love The Amazing Staircase (second to the bottom) for an avid reader, this would be almost dreamlike for me. I wish I had a second story. These are so inspiring. The glass stairs look a little intimidating though if you did slip, not much room for error. All the glass windows. Not so good for moving furniture upstairs. 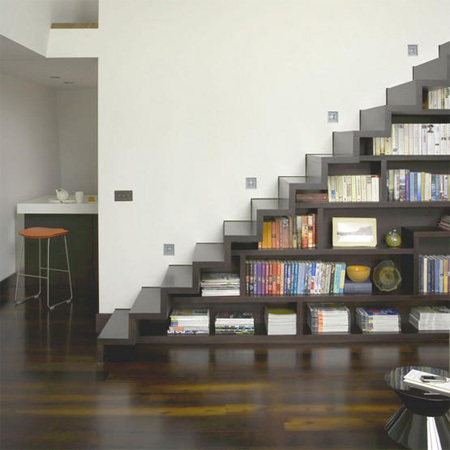 I love the storage stairs. Great for smaller homes. Really nice ideas! When I had a house, for sure that I’ll use some of this designs for stairs. I don’t think they would break, they look thick enough. But using heeled shoes or spilling some liquid on them could pose a large problem. Someone who doesn’t like the owners could just spray some WD-40 on th stairs if they’re really sadistic. Ah, yet another use for WD-40. To ‘The Guy Above is Stoop’, The word in English is stupid. And if you were to look in some upscale architectural design publications you will find many advertisements for stairway designers. Big money in ‘odd’. Wow. Most of these I’d be petrified to climb, but they are all really cool looking. Yeah i can see myself wiping out on these stairs when I first wake up in the morning all tired and eyes half shut. Those alternating stairs wouldn’t pass building code here! what if there was a fire, people might try to escape and fall down the stairs, or firemen running up the stairs would have problems (with all the smoke etc). Might look cool, but not practicle. They would probably be OK on a yacht or ship. Definition: A small porch, platform, or staircase leading to the entrance of a house or building. Haha yeah, because no accidents ever happen on yachts or ships. 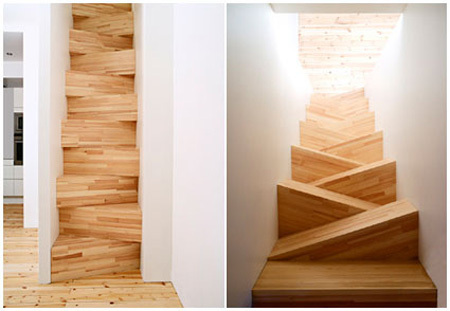 I want stairs like these! 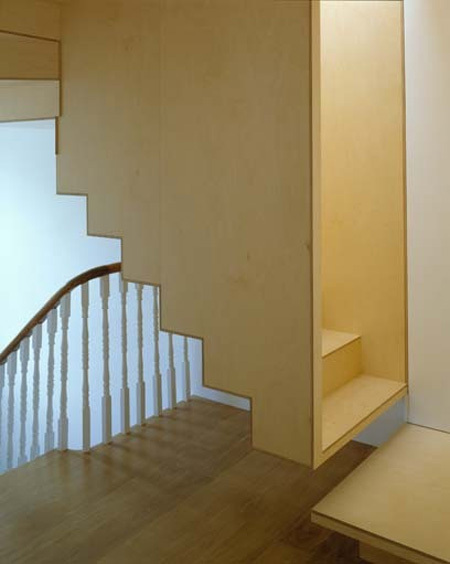 I particularly like the stair cases that double as storage spaces. My favorites are “The Amazing Staircase”, “Longchamp Store Stairs”, and the “Stairway Drawers”. The “Glass Staircase” and “TAF” stairs look cool but kinda scary. Fantastic designs, I’m just worried about the lack of handrails in most of the staircases. I’m usually not sleepy or drunk, but I am naturally clumsy. I love the second one, the way the bench becomes one of the stairs. I would not want to be the furniture removal people on some of these stairs though!! Fantastic design and great looks. As an often wasted cripple I would need “hand rails” at least to climb most of the stairs shown. Also they’d be quicker for the descents. Very cool, I love the floating stairs. I LOVE the books storage one!!! That is the coolest idea! Wow great post and nice stairs!!! …IMO, real designers design for real human beings. Real human beings enjoy looking at designs that excite and inspire. Excessive and unneccesary regulations usually result in a plain and boring designs that you’d really want to hide in a back corridor instead of displaying in the hallway or reception area. You might aswell design a staircase wrapped in duvets with a big inflatable cushion at the bottom just incase anyone is ‘sleepy or drunk’ if you are going to take the nanny state route! I’m a staircase designer for a UK company who have been supplying staircases across the world for 40 years, all of which comply with building regulations, none of which are boring or lacklustre. I find the floating stairs really exciting but I discourage it for households with kids. Whether or not they all pass code in every location is not really important; you have to generate 10 ideas that don’t work to get one that really works well. I love most of these designs, but they have one issue in common: handrails. What is it about handrails that appears to interfere with cool staircase design? @sh2master…. heh heh, yes that is a bit sadistic. Sounds like a great episode for CSI. I was referring to someone hitting the windows on the side though. It’s made for beautiful people who don’t have kids. I just wouldn’t wear a skirt going up the glass stairs… or maybe that’s what the designer had in mind??? Nice collection of staircases designs.. The brilliant use of space for the books is just genius. In France, my hotel room had “Norman Stairs”, half stairs, tipped inward against the wall so they were easier to use. Each stair was placed for the left or right foot and easy to use. They were very steep, almost like climbing a ladder. But with loaded suitcase, I was still able to climb them easily. With the exception of the Longchamp Store design, not one of these appears to meet current US life safety building codes. 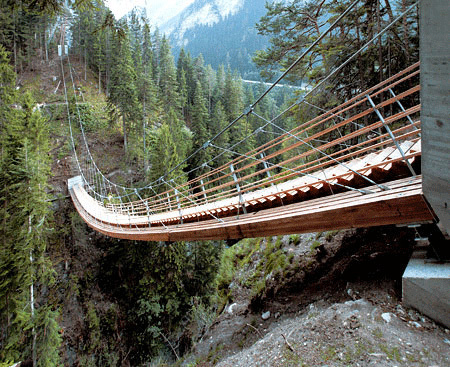 Besides missing handrails, many lack guard rails, parallel edges, even surfaces, and slip-resistant surfaces. For home use, the lack of closed risers and handicapped-accessible nosings is ok in most places. The drawers in a stair riser are a trip nightmare waiting to happen. I think the Longchamp example shows that inventive design doesn’t have to be inherently dangerous. Personally, I hate using alternating tread stairs. Love the design but, I have little ones and could not ever live in a house with any of these stairs. I like the curvy modern marble..its attractive.Great collection.good post. I like the floating stairs behind the glass. These stairways are truly inspiring and wonderfully modernistic. i loved the glass one.. really cool! Beautiful and interesting, but some are highly impracticle and possibly disastrous. 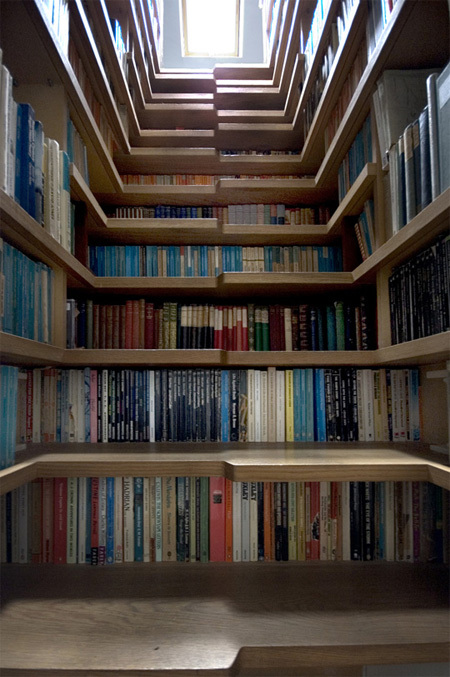 For example, storing books beneath each step is clever, but what a pain if you’re trying to find a particular volume! And is storing fragile items in built-in compartments a good idea on a day when you’re in a hurry, and find yourself running – or stomping, by accident – upstairs? Shaking the entire structure? I get your point about the compartments. However, for the most part, why would you store fragile items there? I would mostly use them for shoes, maybe socks, and other things of that nature. Not fragile items. I’m also sure that it is build fairly well so that it would not break anything inside the drawers. Also, the one with the wheel chair ramp and stairs combined is really ingenious. However, it looks bigger than just a staircase with a ramp on the side. So, that part seems kind of weird. Really great designs overall though. I wish I had a few of those in my house. the designs mirror the creative genius of the concerned architects. but, at the same time, doesn’t the same look risky with regard to having children at home. Levitateitects take top toes on this one. The alternating tread reveal slows down what is otherwise an ordinary movement. As for the infill, you guys should check out Ando’s bookshelf house. I’d love to have the resource to fill those shelves. Wow, a lot of comments! I really love these stairs. I hope to get a chance to try something like this. Mind boggling! Very creative! Hats off to all the designers/architects. 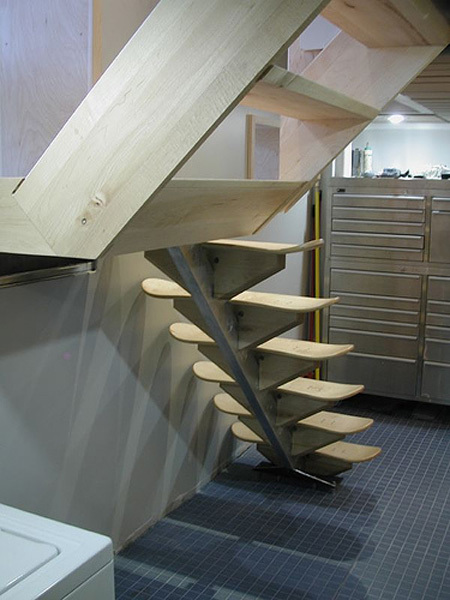 Cool stuff, will get my staircase ideas from you from now on! Really creative solutions! Only public spaces really need to be designed to be navigated even by the generally wasted handicapped… My family grew up on wanky art stairs and they all survived… Let the light of innovation not be crushed by codes! Wow, these give new meaning to stairs. Love how they are perfectly integrated into the settings. YO, I love it. As a designer and newbie to stumble upon , I am inspired. Thanks! 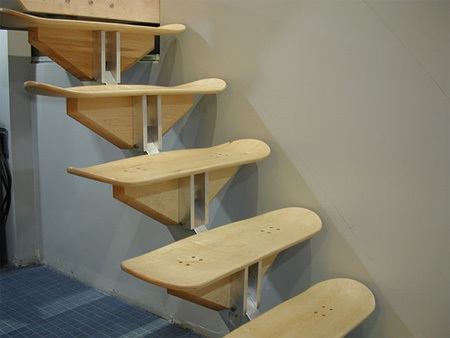 Sweeeeet…i want those skateboard stairs, except that I would actually use ones with graphics and griptape! the stairs that double as a ramp could be replced with a ramp. Why pay extra to make them stares too its, a wate of money. I recall as a teen in the early 1960’s being fascinated by the stairs up to the stage in our school auditorium. They were curved slabs cantilevered from the brick wall. I seem to recall that they were painted deep purple. I think it’s the same building now known as Salina South Middle School in Salina, Kansas, USA. I don’t know whether the stairs are still there. I live in Vancouver BC where Arthur Erickson designed the staircase/ramp back in 1979. As a sleepy, uncoordinated & drunk stair climber, I’m really getting a kick out of these comments. why not insert handrails in the wall? That’s what most houses with stairs have, isn’t it? so the handrails shouldn’t be too much of a problem. I especially fancy curving staircases, with two sides joining in the middle or something. I would love to see something as creative as these with this design element in mind. The stairs with the built in ramp are obviously not practical for mom’s with strollers or the handicapped. The way it twists and turns around is MUCH more effort than a simple straight ramp on the side of a staircase. My family had something like the storage staircase. We have a ‘hidden’ storage in the 2 steps that we have on entering our house. It is only in one(the bottom)step. and the top of the step flips up and you can put stuff in. Growing up it was always with gardening tools, like gloves and spades and stuff. Some of these are amazing; others, I couldn’t dream of living with. 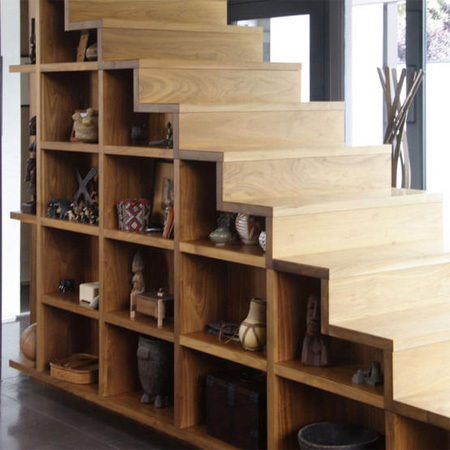 I love the oak storage stairs. Wow! amazing stairs! Too bad you need a 2 story appartment or house to have them in. I’m floored by these images. Stunning, Fantastic, Cool, Speechless. A real breath of Fresh air. That’s amazing, where can I buy it??? Real cool stairways to heaven. So many fascinating ideas. if i have my own house…………. 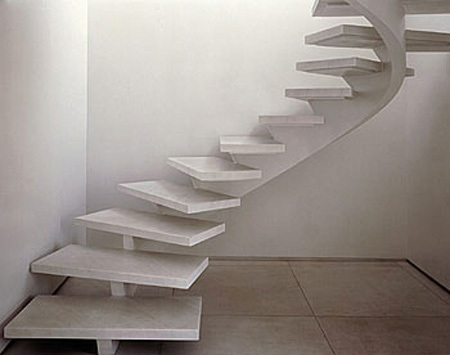 Does anyone know what the stairs like these costs and where you can buy them? or are they custom made? Looking forward to see a reply from someone! I love that there is actually a specific job for designing staircases. ^_^ And I kinda think it’s funny that people are getting so worked up over this. If you think the idea is stupid, no big deal. Don’t get those staircases in your home. Simple solution, right? Personally, even if some of these idea are highly impractical and make me (a naturally clumsy person) a little nervous, they are none the less amazing, artistically genius designs. a guy above me is stoop; U need a clue to look through this website and read the comments to try and mock someone when you can’t even spell EVER! The stairs are ART and creative designs, that makes it interesting, and not drinking, if no one should drink then this website would not probably exist, go back to church but when the wine comes around make sure you do not ingest it better than every one else.. btw.. great stairs.. a great link on the website would be creative hand rails.. 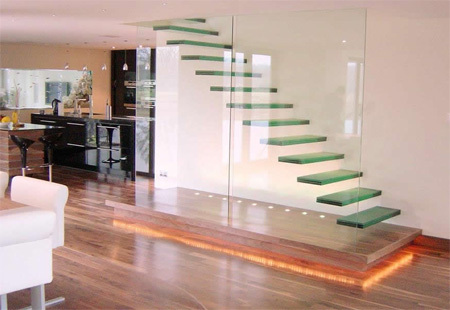 Incredible and oh so beautiful…I love the glass stairs and all the storage stairs. I can’t wait to buy a new home and see if someone will do these designs for me. The creativity is really amazing. I really admire the deep thinking of designer for space saving concepts with storage area and off course a unique design which will be no where else. Hats off to you people. Are people crazy these days?! 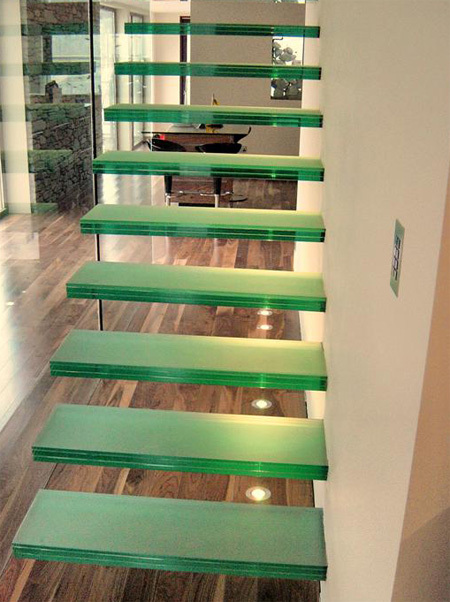 for the glass stairs and floating ones, you would have to be like 2 pounds to walk on them. The stairs are cool looking but not practical. Many, many people would be dead. love the book stairs though…that would be AWESOME! love the book stairs though…that would be AWESOME!!!!! Stairs areawesome. 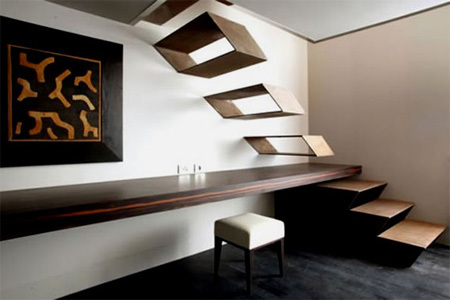 i love the box stairs and all the ones that have some sort of storage incorporated into them. i like the idea of utilizining the stairs speacily for box… n i dnt drink so i loved it. I LOVED the CLEVER BookCase Stairs. I will do anything to get those. Suicide Stairs? I highly doubt an architect would design something that would cause death. In fact, I know for certain they wouldn’t. they’re all just so amazing! incredible, there isn´t a better way to enjoy the space, let´s make a visit to our stairs!!! At my parent’s house, when I still lived there, before my sister and I finally got our own rooms my dad custom designed and built our beds. He called them loft beds and for the stairs we had bookshelves much like the ones pictured above. I actually thought it was originally his idea, I’d never seen anything like it. a tetris design staircase would also be fun to see, esp. in kids room. Beautiful to look at, inspiring in design. As an afficianado of off-beat design concepts, I like them. As a Code Official (Building Inspector), I can assure you that few of them would pass review even for a Single Family Dwelling. They would make nice displays for an Architectural Showcase, but that’s about the extent of their usefulness (at least in places where Building Codes are enforced). I wish innovative designs like these were used more often. I’ve never seen staircases like these. I could use the storage space. Ingenious! Am sold on the storage staircase! @Suicide Stairs: Those stairs can actually be pretty durable depending on the material they’re made out of, regardless of how impractical the design may seem. Just take a look at the Grand Canyon’s Skywalk, which not only appears to defy gravity without any obvious support structures, but does so with glass platforms for people to walk on. While on the subject of those two staircases, they actually happen to be my favorites, design-wise. Dangerous? Very likely, but that wouldn’t stop me from getting one if I could! There are fantastic design, but I wonder about their safety. creativity to be celebrated for sure. Take away rules (and in some cases budget) and it’s amazing what can be accomplished. The ones deserving a tip of the hat herein are the ones that followed the rules AND were creative (i.e the ribbons). nicely done. Pretty neat ideas. I’m really into stair designs and execution. Most of these would not be code compliant in many communities but if you can get away with it – Go for it. Tempered glass can be a lot stronger than most people whose experience is mainly with thin cheap float glass think. Those appear to be several centimeters thick, and it would probably require considerable effort for a fairly strong man to break them with a hammer. The marble stairs, which no one seems to have had a particular problem with, may actually be more fragile than the glass ones. The stairs with the drawers or bookshelves in the risers look clever at first glance, but after thinking about it more, it seems like they really aren’t all that efficient in terms of space (drawers/cubbies in the SIDE makes a lot more sense) and are ridiculously non-ergonomic unless the stairs are much steeper than normal – you’d have to either bend over or reach forward more than most people would find comfortable. Some of those staircases look like what we had when I lived in Germany. We had alternating stairs with out back panels. It was ridiculously hard to carry things up and down them, or just walk up them when your sleepy. They are always a topic of conversation though. Question. Does anyone have any idea on how the darkwood storage bookcase stairway is made. Our home has stairs already that look just like the home. Wondering what materials or stains… are made to give it that shiny finished look. Stumbled here from Manchester NH! In regards to people’s fears of the “green glass stairs” go to the Apple Store in Boston, MA (or just look it up online.) In the center of the store they have a rounded staircase that goes up 3 floors made entirely of glass. Thousands of people of all weights go up and down them every day. It’s impossible to tell in the pictures but the tops of each of the steps are covered with grooves/bumps to prevent slipping, and if you are worried about wetness heavy slip-proof stair treads work fabulously! Also, the thicker glass gets the greener it becomes-meaning they are not colored to be green, and they are pretty thick, they won’t break on you. I do hate the alternating feet steps though, I would definitely die on those anytime of day. 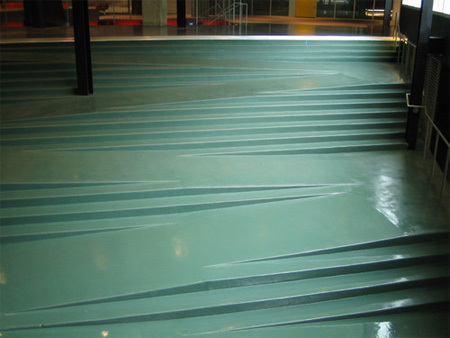 Do you have an idea of what material for a transparent non scratch stair tread can be used? I can’t stop gaping at the glass stairs. They are beautiful, but my entire family would be hospitalized on those things as we are all klutz’s. Those stairs are absolutely gorgeous. But I wouldn’t feel safe in allowing my grandparents to walk down the alternating steps. I’d be really afraid of them getting hurt! And afraid of having to carry heavy objects up and down the staircases as well! I really liked the curvy stairs, now thats what you call very cool! I even like the way they use “skateboards” as steps when you go up and down the stairs. 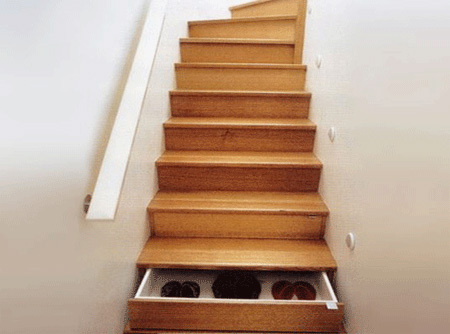 Drawer storage in stairs is mad. Leave a drawer open and kill someone coming downstairs a night! The alternating stairs etc are only allowed for secondary access or special storage situations. Open plan / no side protection is also now illegal in UK. Read the Building Regs or codes for your country before going for any of these ideas. what an awesome staircase you have there.I like the one with floating…incredible..
very clever ,beautifull ,imaganative, artistic, but not for every body’s house. I wish i lived in a glass house to have one of these . You don’t have to be sleepy, drunk or even party-pooper to fell down stairs, accidents do happen to everyone. And when you do slip, you’ll love a handrail. I did slip on our old stairs (no handrail) at 2007 and broke my tailbone. It did hurt next six months every time I was sitting and it was Painful. It still hurts sometimes. I’m just glad I didn’t broke my back, I could be staying on a wheelchair for rest of my life. I don’t know why designers don’t pay more attention to handrails instead. They shouldn’t cut those out, they should make handrails perfect and beautiful, that would make them a Good designer. The ones with the clear plastic really scare me. I would have to put stickers on them. Its a dilemma with modern design — some things that look really cool turn out to be impractical and are dangerous or might fall apart after many years. I’d rather have stairs that are safe but boring instead of cool and dangerous. I live in a 110 year old house with traditional steep and “narrow” stairs, and after a year of living there I was sick of them too, since I have to be careful when I walk down them (walking up is no problem). Thankfully they have a railing at least. Why would you go to a website of open staircases, then complain about the lack of risers and handrails? The staircase in my home has a rail, since our children were small when we built, and they also have a built-in television cabinet and storage areas beneath. But you aren’t required to follow all building codes when you build a private residence, at least not where I live in Mississippi, not inside city limits. Why should the government decide for me whether or not my stairs are safe? I’m pretty sure I’m a better judge of what’s acceptable in my home than the government is. Nice ideas…which one is supposed to adapt according to need and use,not to complain!.Respect the designers for thinking out of box. Love the look of no railings! Code and safety nerds be damned! If you aren’t a couple with kids and don’t have a drinking problem, why not have a nice clean look? I have a staircase that has no rail on one side (much like the black bookcase stairs but with a railing on the wall side) and we’ve lived with it for several years with no problems. Europe has many locations with stairs that have no railings, yet there aren’t any local reports of stairway deaths getting out of hand. If I want to live in my own house with no railing on one side, that’s my business. Anyone who is trying to make us do otherwise has control issues.